February 11, 2019 By Allyson 14 Comments This post may contain affiliate links. Read my disclosure policy. Air Fryer Roasted Broccoli is an incredibly easy, fast, and delicious side dish. This lower calorie air fryer option will become a staple side dish! Broccoli is one of my favorite side dishes, but I love for it to be roasted so it has a nice bit of crispiness to it. Broccoli is incredibly healthy, has low carbs, low calories, and fits into most specialized diets. Using the Air fryer to roast broccoli is faster than using the oven, doesn’t heat up your house, and makes the perfect non-soggy broccoli! 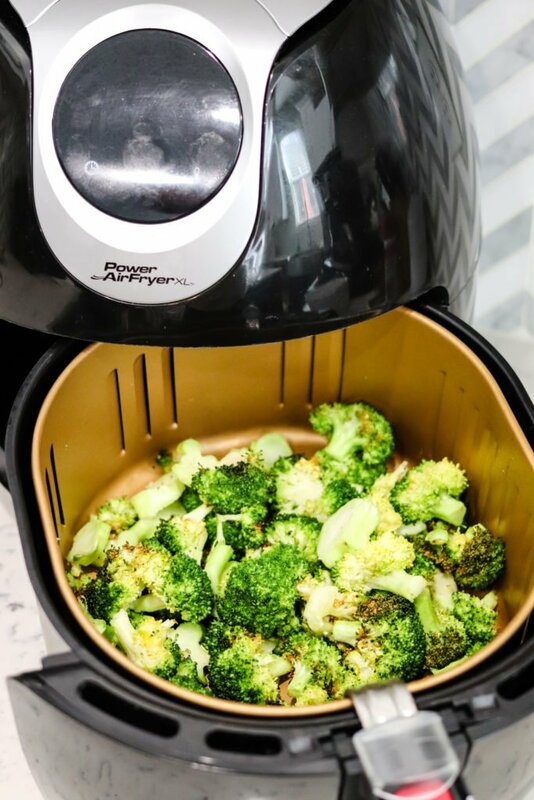 Once you try this Air Fryer Roasted Broccoli, you will never cook it any other way! Make sure you checkout my Air Fryer Crispy Parmesan Brussel’s Sprouts and Air Fryer Asparagus Fries as well! First thing is first, you must have an Air fryer. 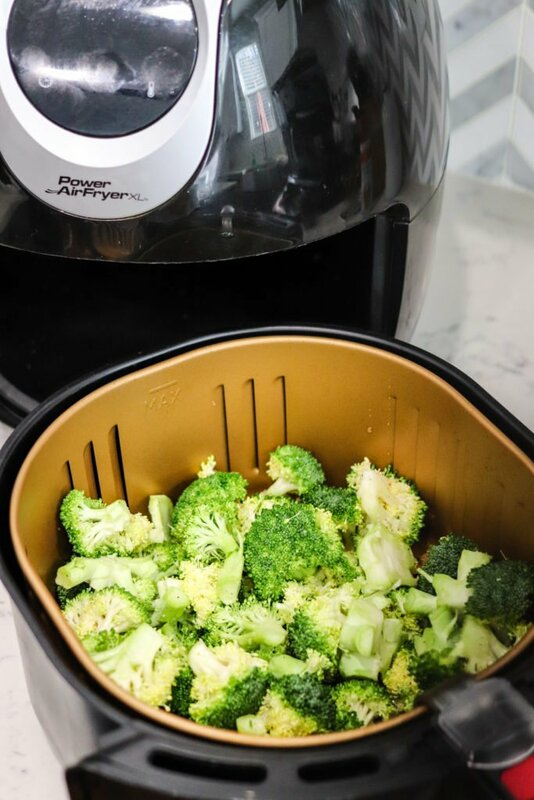 to make this Air Fryer Roasted Broccoli. I really like my OMORC Air Fryer XL, 5.8QT Air fryer! Making the broccoli couldn’t be easier – it’s only 3 ingredients (from your pantry) and comes together in just a minute, and cooks in less than 10 minutes! Prepare the broccoli; Trim the florets off the bunch, then chop up the stems, you can use that to roast as well! 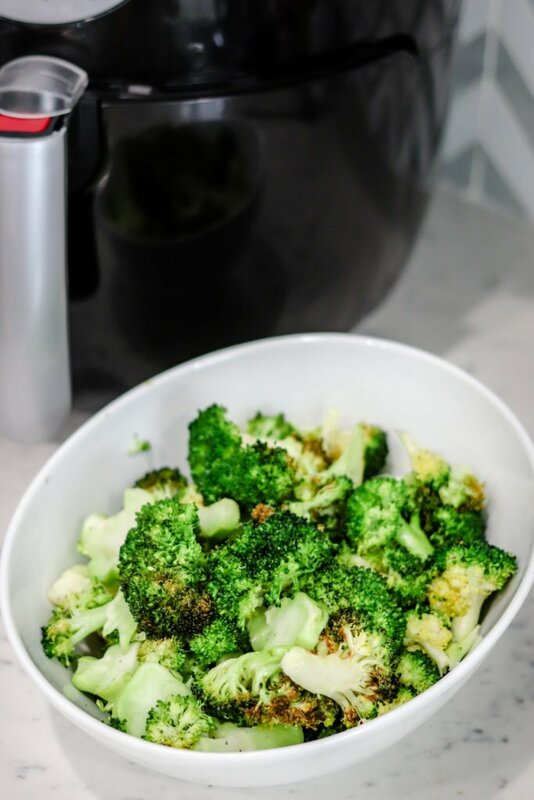 For this air fryer roasted broccoli recipe you can make as much as you want, but I used 2 broccoli bunches. Add broccoli to a bowl, then add 1 tsp olive oil, salt and pepper, and toss to coat. Add 1/4 cup of water to the bottom of the air fryer (under the basket in the actual basin). This will prevent it from smoking while cooking. Add the broccoli to the my Air fryer basket, then close and set to 400 degrees for 7 minutes. Remove and enjoy! 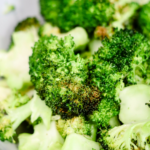 Is Air Fryer Roasted Broccoli Healthy? YES! Air Fryer Roasted Broccoli is great because it uses less oil than roasting in the oven, and the air fryer helps crisp the broccoli. For 1 cup of broccoli, it contains 61 calories, 4 grams of fat (healthy fat from olive oil), 6 grams carbohydrates, 2 grams fiber, and 3 grams of protein. Additionally it contains 125% of your daily Vitamin C! Air Fryer Roasted Broccoli also fits into most diets- KETO, Paleo, Whole30, vegetarian, vegan, and low carb/Atkins just to name a few. What type of Air Fryer should I use for Roasting Broccoli? Air Fryer XL Touchscreen by Cozyna (5.7QT) is a large air fryer that looks to cook evenly! GoWISE USA 5.8-Quarts 8-in-1 Electric Air Fryer – this one includes a recipe book with over 50 recipes!! Asian Glazed Brussels Sprouts – perfect dinner companion! Roasted with a delicious spicy sweet glaze that everyone will love! Air Fryer Avocado Fries are creamy and crunchy without any oily mess! With only a handful of ingredients, these are the perfect healthy snack or appetizer! This is the best Copycat PF Chang’s Spicy Green Beans recipe and perfect as a side dish or vegetarian main dish served over rice! Instant Pot Garlic Hummus Recipe only has a handful of ingredients; Save money and know exactly what’s in your food with this recipe ! Garlic Ginger Spinach is the perfect blend of Garlic and Ginger, sautéed with delicious healthy fresh spinach. Air Fryer Roasted Broccoli is an incredibly easy, fast, and delicious side dish. 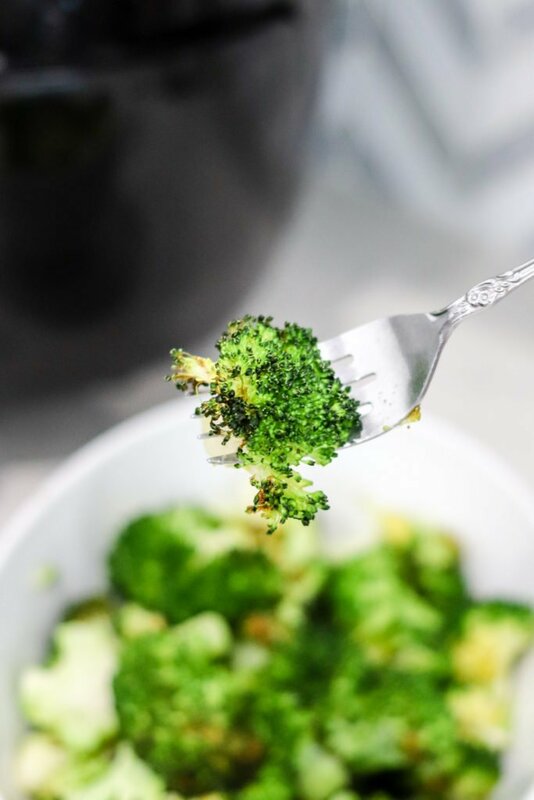 With only 61 calories per serving this air fryer roasted broccoli will become a staple side dish! Add broccoli to a bowl, then add olive oil, salt and pepper, and toss to coat. Add the broccoli to the Air Fryer basket, then close and set to 400 degrees for 7 minutes. Remove and enjoy! Makes 4 one cup servings. Nutrition per serving: 61 calories, 4 grams of fat (healthy fat from olive oil), 6 grams carbohydrates, 2 grams fiber, and 3 grams of protein. Yum! This is a great way to cook broccoli. I loved it! So easy and delish! Perfect for busy nights! I love broccoli and these turned out great! So easy and delicious, thanks! LOVE my vegetables with a little crispy edge – this is the perfect way to achieve without having to heat up the whole oven! Looks incredibly delicious! I love how so quick easy to make this, definitely having this on our table! I’d love to give it a try!! Looks delicious! I love roasted broccoli, too, and how awesome that you can get the job done in an air fryer! 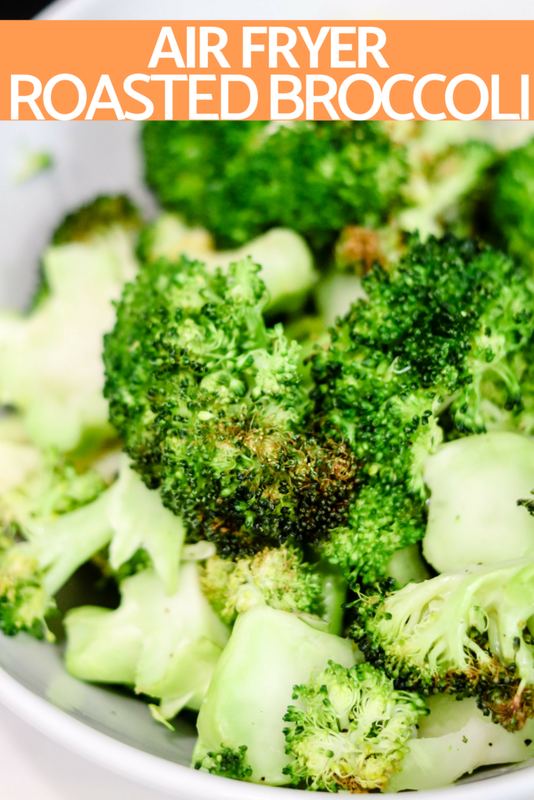 I’ve never tried roasted broccoli in the Air Fryer, but it sounds healthy and delicious! This might be the only way to make broccoli! I love how quickly it takes from start to finish. I have a weakness for kitchen gadgets and have yet to try an air fryer – thanks for this recipe! Air fryer is the BEST! Totally in love with mine!